‘Tis nearly April, so it’s time to giveaway another free download from our 2014 Fast Bikes calendar. Every month we’ll be offering you one of last year’s Addiction finalists, who all had the chance to win a pair of Dymag rims. Simply click on the pic and download the PDF, which you can then print. April is all about Scott Acutt’s Crescent-rep GSX-R750 and the gorgeous Lauren. The mod list is an extensive one (the bike’s, not Lauren’s) – Akrapovic TI exhaust, HM q/s, AIM Pista dash, STM slipper clutch, Öhlins/K-Tech suzzies, Marchesini wheels and Brembo calipers are just a small part of Scott’s work. 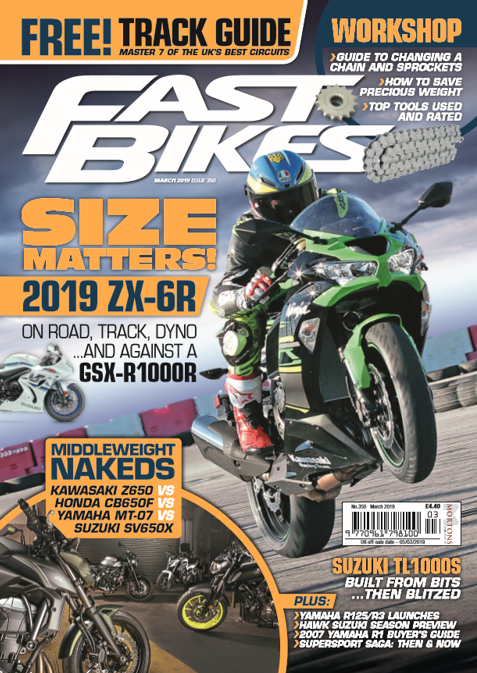 Previous Post:Fast Bikes Magazine May 2014 is OUT NOW!